Every Mad Hatter needs a Misses in their lives who is just a mad as they are! 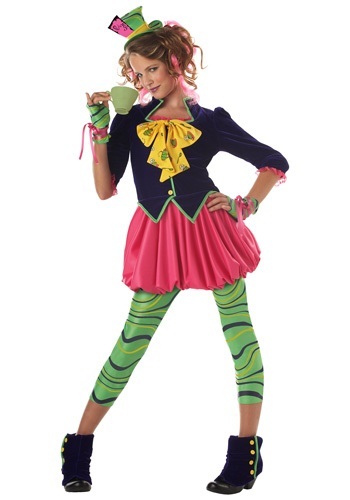 Throw on this Wonderland Miss Mad Hatter Costume and be the perfect counterpart to any insane hat maker. Everyone will want an invitation to your tea party this Halloween! When you're running around the party in this colorful guise everyone will assume you've gone completely bonkers, and they wouldn't be wrong. Ensure everybody you are on a descent into madness with a nervous maniacal laugh, an eye twitch here and there, and a smile that walks the fine line between sinister and sincere. Get all that down perfectly and you may even be locked up in an asylum for the mentally deranged! That's when you know that you really knocked this act out of the park. Now, remember that you don't have to be the only one who loses their mind this Halloween. Invite all of your friends over for a wild Wonderland themed tea party! Check out the rest of our Wonderland character costumes! You can have March Hare, Alice, Cheshire Cat, the White Rabbit and the rest of those kooks join you for a relaxing cup of tea. Just be sure to remind everyone of proper tea-time etiquette. Elbows on the table, shouting is the best form of communication but singing is a respectable alternative, and the best butter is always kept in your pocket watch. This may not seem all that proper, but, in reality, it is as proper as one can get at a Mad Hatter tea party!